I know there are many people who host their websites on WordPress.com. There is nothing wrong with that other than the fact that there are certain things you can’t do, like import your own themes, when you want to customize your website’s look and design. That flexibility comes with having your own self-hosted WordPress site. If you are unsure how to create your own website, HTML: QuickStart Guide – Creating an Effective Website can guide you step by step. You can get the Kindle E-Book free for 5 days. The promotion actually started about 2 days, so you have 3 days (inclusive of today) in which you can get it for free. The information about the e-book is below. If you are a vegetarian and looking for some fresh new recipe ideas, then this e-book is just for you. 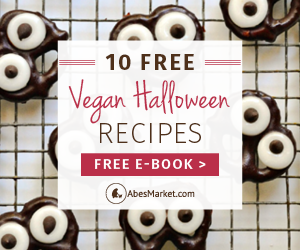 There are 10 Free Vegan Halloween Recipes located in this easy-to-read book that are sure to be a delight to your taste buds! I know that at times it is difficult to come up with new ways in which you can prepare vegan meals, so I am offering you the e-book free of charge. All you have to do is enter your email address and then click download – no gimmicks, no catches, nothing to buy. In just a matter of seconds, you will have these delicious recipes in your hand, ready to be prepared. We have all come to know the importance of eating healthy. More and more people are switching from red meat to vegetables and there is no greater way to gain a love for vegan food than by cooking up some great tasting recipes. So go ahead and download the e-book now and get cooking. I know you are hungry, so the sooner you get the book is the sooner you will be able to chow down on your 10 free delicious vegan meals! Women, Can You Spot a Cheater? Before you tell me which of the guys in these three relationships do you think is cheating, let me tell you this: Every single one of those guys is seeing other women. A few minutes ago I finished reading a new ebook by John Chow called “The Ultimate Blog Profit Model” and I must say that it was pretty impressive. I think you will really enjoying read it as much as I did. For those of you who do not know, John Chow runs one of the biggest and most profitable blogs in the world. In fact, he makes over $40,000 a month just from blogging! His new eBook provides the exact details of exactly how he does it. Best of all, the book is free and you can even win you an Apple iPad! John will be awarding a new 16GB Apple iPad to one lucky person who downloads “The Ultimate Blog Profit Model”. I have already entered the competition and now it’s your turn. You canÃƒÂ¢Ã¢â€šÂ¬Ã¢â€žÂ¢t lose on this deal. You get a free eBook detailing how John makes over $40K a month from blogging and you also get a chance to win a 16GB Apple iPad as well. The Traffic Tips Report is a short report by Justin Michie that boasts 247 ways to drive traffic to your sites and blogs. And right now itÃƒÂ¢Ã¢â€šÂ¬Ã¢â€žÂ¢s free for a limited time only from this website. So is it really necessary to have 247 different ways to generate traffic? IÃƒÂ¢Ã¢â€šÂ¬Ã¢â€žÂ¢d say yes. Like a lot of online business owners, I have websites in all different types of niches. Therefore the more options I have for traffic generation, the better. Some methods may not fit for one niche, but it may be just the thing to flood another niche site with traffic. I have read through the Traffic Tips Report several times and it seems each time I read it, I discover something I missed before. Some of these traffic generation methods are so simple, but so overlooked, itÃƒÂ¢Ã¢â€šÂ¬Ã¢â€žÂ¢s insane. A very important part of this report is about where you promote your websites. A lot of times website owners will concentrate on promoting their site just on the web. I know I have been guilty of having tunnel vision when it comes to this. The report is helpful in that it goes beyond this thinking and lists quite a few ways to promote your site offline. This can give you a major advantage because your competition is probably not thinking about these kinds of traffic generation strategies. I know that a lot of times I get into a rut and try to same old traffic generation methods day in and day out. And I realize these methods may not be the best way to get traffic to my site. But when I try to think up new ways to generate traffic, I usually come up with nothing. That is why this report comes in so handy. I save myself a ton of time by just going down the list of traffic generation methods. I choose the one I want to try and give it a go. If it doesnÃƒÂ¢Ã¢â€šÂ¬Ã¢â€žÂ¢t work for my niche I can make a note about it and try the next one. I now have a valuable resource at my disposal that I can refer to any time I need more traffic. This report is very easy to read and understand. It doesnÃƒÂ¢Ã¢â€šÂ¬Ã¢â€žÂ¢t hold your hand, but it does contain links to the sites that you can visit to increase your exposure. After using these sites, I have noticed a significant increase in traffic to my sites. Justin Michie has put together an extremely useful resource here ÃƒÂ¢Ã¢â€šÂ¬Ã¢â‚¬Å“ putting years of research into a single report. If you are dedicated to your online business and are serious about generating more traffic, you need to get the Traffic Tips Report. My only regret when it comes to this report is that I wish I would have gotten it sooner. If you havenÃƒÂ¢Ã¢â€šÂ¬Ã¢â€žÂ¢t gotten it yet, you can pick up a copy by clicking here.